Nice R2-D2 interactive. And is that an Anovos Stormtrooper suit? yeah, i'm actually waiting for mine in the mail. 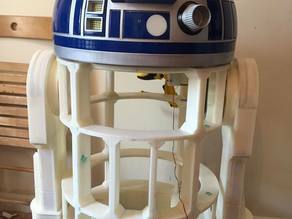 Its taking its time(: As for the interactive i'm trying to make a custom r5-d4 version. Superb! I left glueing until I had a full picture as to how it would fit together. I've just tweaked the legs as I'm moving towards full assembly. I'll post the additional files in the next few days but the shoulders and booster cover is removable, held on by magnets (N52 discs, 10mm x 4mm) for access to the foot bar and any cabling. starting to contemplate the process for painting and was wondering what you felt worked with regards to having it all glued together first and then mask up to paint? or did you paint the different coloured individual bits first and then glue them on? Oh and for the booster cover. The little tabs that keep it in place were they glued to the legs or to the booster cover? I guess either way wouldn't matter? How far along is this and will you be selling it? I have a static model, 2-3 leg conversion model and one that is mobile via remote control.